Al Gore’s Generation Investment Management is a backer of the electric scooter company. A bold idea to make low-carbon transport more accessible just hit a major milestone. On Tuesday afternoon, startup Gogoro­ -- which makes electric scooters and builds battery-swapping networks to charge them­ -- announced that it has raised $300 million from a group of investors including Al Gore’s Generation Investment Management. Gogoro previously raised $182 million in two rounds, bringing its total funds raised to nearly $500 million. Gogoro founder and CEO Horace Luke told GTM the funds were raised at a post-money valuation of slightly over $800 million, making Gogoro “not yet a unicorn,” he said. In addition to Generation, other investors in the round included Singapore investment bank Temasek, Japanese conglomerate Sumitomo and French electric company Engie. Existing investors include Japanese battery maker Panasonic and Taiwanese entrepreneur Samuel Yin. Both the funding and the investors involved are a big deal for six-year-old Gogoro, which came out of stealth in late 2014 with an idea and some initial funding. The concept: build a battery-powered scooter that would excite riders, and build a network of battery stations where those customers could swap out their discharged batteries at their convenience. The fact that such high-profile investors are willing to put so much money into the startup is a tribute to Gogoro showing that its idea and its technology can work in some initial markets. The move also shows how some investors are still willing to back big and somewhat risky ideas in cleantech and energy, while many Silicon Valley financiers shy away from these types of companies. 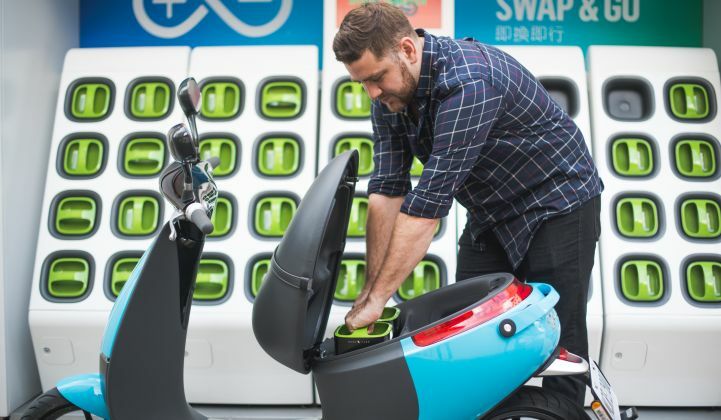 Gogoro launched its first battery-swap network in Taipei in 2015. According to Luke, the company now has 400 battery swap stations deployed across Taiwan. Those customers swap 17,000 batteries on those stations every single day. In some areas of Taipei those stations are located about every half mile. Gogoro, working with German battery and auto tech giant Bosch, has also launched a network in Berlin, but that system is focused on scooter-sharing. The company has also been working on expanding to other cities like Amsterdam and Paris. In cities where 2-wheel transportation (i.e., scooters) has been widely embraced, the business model of owning the scooter and subscribing to battery-swapping services is a strong one. That’s how it works in Taipei and likely would in other mega Asian cities. But in cities where customers are not as used to buying and riding scooters, scooter-sharing networks are a better option. Gogoro says the major funding round will go toward expanding the networks and to research and development. Gogoro launched its first scooter in 2015 that came with all of the bells and whistles, but was on the more expensive side. Earlier this year, the company added a cheaper scooter option to its lineup, and brought in a lot more users. Both scooters are designed to appeal to riders. Luke is the former chief innovation officer at gadget maker HTC and also worked for almost a decade at Microsoft, helping to deliver products like the Xbox gaming console. He’s been focused on designing a scooter that has the latest in digital technology, combined with two modular batteries from Panasonic that can be swapped out on demand. There’s also interesting technology being used to manage the charging network. Gogoro’s algorithms use data collected from the battery to determine when and where the batteries should be charged across the network. That will be an important feature if electric scooters and vehicles ever become a major energy draw on grids in cities like Taipei. To date, battery-swapping networks for electric cars have largely failed. Startup Better Place crashed and burned after raising close to a billion dollars from investors. Tesla deployed a test battery swap station in California, and designed its car batteries to be swappable. But Tesla CEO Elon Musk ended the swapping experiment after he said customers lacked interest. This may only be a temporary pause, however. This spring, Tesla filed a patent for a mobile battery-swapping rig. But there's no indication this will amount to a real-world offering anytime soon. Will Gogoro be the company that actually makes the battery-swapping business model work? Its unique approach -- using scooters and focusing on Asian mega-cities -- is notably different than what’s been tried before. Given the recent funding round, the company’s investors are clearly willing to make the gamble.